Dr. Olu Oluwa-Tofehintis the Senior Pastor at House of Praise Foursquare Church. Olu is a graduate of International Bible Institute of London and University of Greenwich, London UK. He further pursued the call to ministry and graduated in 1999 from Surrey University, UK with a master’s in theology. Olu went on to receive his Doctor of Divinity in November 2017. Olu has planted churches in Europe and the US. He’s spent his life in ministry serving the body of Christ. Olu's concern for the problems of our communities is expressed through his approach to discipleship and leadership based on strong biblical and spiritual principles. From Africa, Europe, to North America, many people have been touched by his message of transformation, faith, healing and God's love through his stewardship ministries. 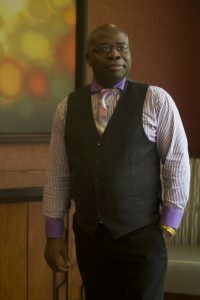 Olu is an ordained minister of the International Church of the Foursquare Gospel. Olu is married to Bola; and they are blessed with one son, Toni and two daughters, Semi, and Toluwani. My inspiration is from God. I am a outliner, I outline on paper. I don't create sketches, I just map out the direction I think I want to go through.